There are several Lippincott Library resources that contain advertising expenditure data, but only one that tracks it at the advertiser/brand/product level, by media, by market. That is AdSpender, from Kantar Media. AdSpender allows you to find out how much advertising is being done (in dollar amounts, or by units aka number of ads) over time. Our subscription includes a rolling 5-year period. One great way to use this during this election cycle is to track presidential campaign ad spending, down to the city level. This way we can see in which states the candidates’ campaigns feel the race is close and want to spend more, and in which states they feel confident in their winning Electoral College votes – a great indicator of where political advertising dollars will be spent. Once you enter into AdSpender, use the Custom Reports menu on the left to click Create. First, you’ll be able to select from a large menu of Available Media – including Network TV, Cable TV, National Newspapers, Network Radio, Internet Display, and even Outdoor (such as billboards). Select all or as many media formats as you’d like to track and move them to the Selected Media menu. Or, click on the Media tab to select certain Designated Market Areas (DMAs) of interest. Then click the Next link in the top right (how you’ll navigate through all steps of this process). Now we can choose the time period that we’d like to have measured. To check the date range coverage of the media format that you are interested in, click on Availability in the top right corner. Remember that our coverage is on a rolling 5-year basis. You also have the choice of viewing the data as one large aggregated sum (Time Period-Single) or at a monthly/quarterly level (click on the Select Multiple Time Periods button). has been properly added to your report. 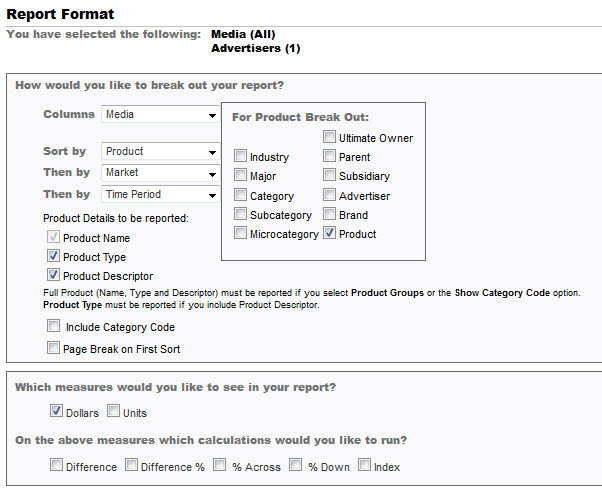 Step 4 is where it gets fun, because we can customize our report format to the detailed level we’d like to see. So, for example, I can break out my columns first by Media, then by Product, then by Market, then by Time Period. 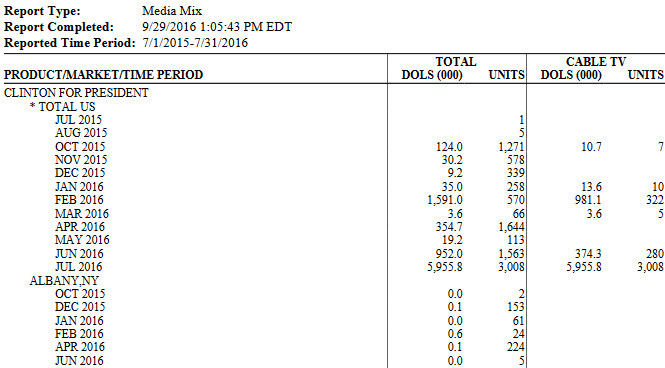 So I’ll be able to see, for each campaign, the spending on each media format then sorted into the DMAs that saw this coverage, then see the trend over time. Set any addition Report Format (e.g. to show both Dollars and Units) and Report Options you’d like (e.g. font and shading preferences), then set a title and hit Run Report. The Report Viewer menu shows you all of the recently created reports within Penn’s subscription. The report will move through stages here – Submitted, Running, Completed. This can sometimes take a few minutes. One trick if you’ve noticed that your report is taking longer than you’d like is to hit the Refresh Listing link, which will manually refresh the menu rather than waiting for it to auto-refresh. Then you’ll be able to view/download the report, in both PDF and .csv formats. This entry was posted in In The Library, Uncategorized by Mia Wells. Bookmark the permalink. Mia is the Business Research & Document Delivery Librarian in the Lippincott Library @ Wharton.